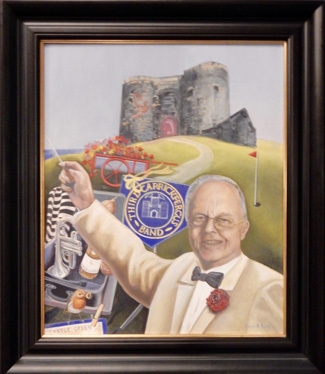 Desy Graham's remarkable 30 year tenure at Third Carrickfergus Band has been fondly celebrated as he takes his leave of the baton. 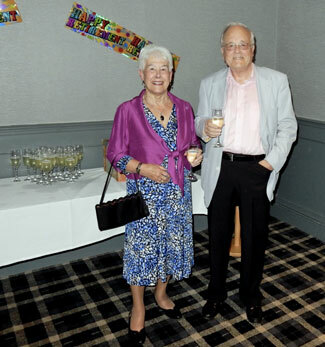 Desy, members, supporters and guests of the Third Carrickfergus Band recently gathered at the local Loughshore Hotel to mark the retirement of their conductor of over 30 years. After a drinks reception and dinner there were speeches from numerous band members which showed the universal esteem Desy is held within the brass band movement, not just locally, but throughout the banding world - shown by the numerous messages of congratulations and thanks which included video messages from Peter Graham, Richard Evans, Mike Fowles, Paul Lovatt-Cooper and Philip Harper to name but a few. The band presented Desy with a commission from local artist Glynis Burns, showing him conducting the band along with some of his cherished memories from the past 30 years. He was also presented with a set of binoculars which presumably he will use to look at the painting from his rather spacious living room!. To say that Desy was just the conductor of the band for 30 years really does not capture the essence of the man. As a founder member of the old 3rd BB band in 1958 Desy has been a player, mentor, marriage guidance councillor, bank manager, surrogate parent, therapist and golf coach to a lot of young people who have passed through the ranks of the band! Furthermore he was also librarian, equipment officer and even repaired the instruments when required. To cap it all he managed to have a remarkable success rate in contests and the band was voted Northern Ireland Band of the Year on a number of occasions. The band also paid their thanks to Desy's wife Liz, who has been a remarkable support to him over the years. All members of the Third Carrickfergus Band, friends and loyal supporters wish Desy and Liz a long and healthy retirement together. They have certainly earned it - and many young (and not so young) people will be eternally grateful for their support over many years.